One of my absolute favorite places in Charlotte is the Whitewater Center. Not only is there a ton of stuff to do there, but everything about the place just puts out this really cool vibe that makes me say, “This place is so cool. Why don’t I come here more often?! ?” I say it basically every time I go there. The Whitewater Center opened in 2006, and it has been steadily growing ever since. The 700 acres that make up the facility was inspired by the Penrith Water Stadium, and it contains the world’s largest artificial whitewater river. (That’s a cool fun fact I didn’t know before I started writing this post.) The river is pumped full of 12 million gallons of well water every day to keep those rafts crashing through the rapids. Whitewater Rafting: well, yeah, obviously there is rafting. Guests can choose whether they want to embark on a family ride with Class II and III rapids or the adventure side which contains class IV rapids. Or if you are really daring, you can pay a little upcharge and do the rodeo raft! Whitewater Kayaking: this activity isn’t for everyone. Kayakers have to have their own gear unless you are enrolled in the kayaking lessons. However, it is crazy fun to watch them zoom through the river. I seriously want to try this so bad! I may just sign up for lessons this summer. 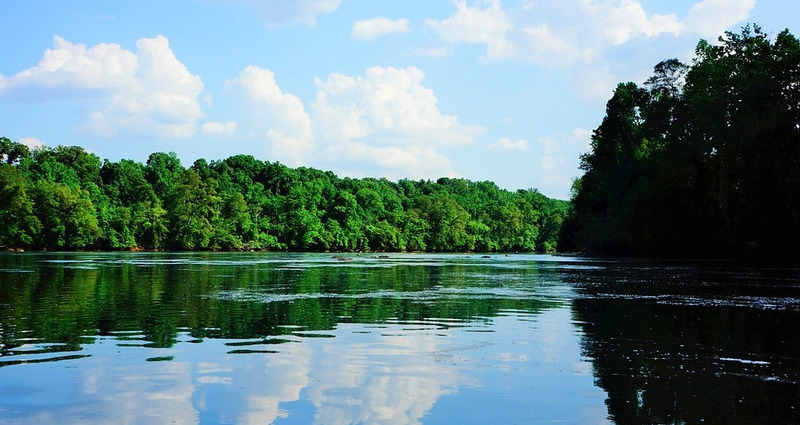 Flatwater Kayaking: not only does the USNWC have it’s own manmade river, but it is right on the banks of the Catawba River. So, you can grab a PFD (not a lifejacket as all USNWC employees will remind you) and your kayak and plop down in the river for an hour or two of paddling. I have seen herons and tons of turtles while paddling around down the river. It is super relaxing, even if it is quite a workout. Standup Paddleboarding: if you have never tried paddleboarding, you have to give it a go! I love it, and it will give you quite the ab workout! I’m not gonna lie, it takes a minute to figure out how to balance, but its not a big deal because if you fall you just land in the river. Easy peasy. Mountain Biking: this is one of my husband’s favorite things to do at the center. They have miles and miles of trails at different skill levels, and if you have your own bike all you have to do is pay for parking! If you don’t, no worries, they have bikes and helmets for rent. Ropes Courses: there are a couple of different ropes courses so that you can play in the trees. One is a little more family friendly, and one you have to show that you are able to do a pull-up before you can play. At some points you are over 50-feet in the air but don’t worry, you have a harness holding you up in case you slip. Zip Lines: people are always zipping by overhead when you spend time at the Whitewater Center! There are a few different lines the biggest is over 1,000 feet long and starts from a 46-foot tall tower. I have only worked up the courage to ride the very baby zip line, so far. Oh, and one isn’t really a zip line so much as a jump line. Basically, you jump from that 46-foot tall tower and freefall for a bit before the harness slows you down. It is unlikely that I will ever work up the courage to try that one. Canopy Tour: this guided tour isn’t included in the regular passes, and it has to be scheduled in advance. I haven’t had the chance to check it out yet, but I do really want to! It is basically a zip line/ropes course that goes between 14 different towers or platforms up in the treetops.At one point you even travel over a 90-foot deep canyon. All that playing is bound to make you hungry and very, very thirsty, right? Well, no worries there because the center has an amazing restaurant called River’s Edge where you can order fried pickles or pimento cheese appetizers, huge salads, the best looking chicken and waffles I have ever seen, or a big fat juicy burger! The menu is well-rounded, and I have honestly never had anything that wasn’t so damn delicious from that kitchen. If you aren’t too stuffed with your entree, then you should totally dig into one of their Instagram-worthy desserts! If you are just looking to quench your thirst than you have many options as there are taps in just about every building you pass! The bike shed is usually a good spot to hop in and grab a beverage because the line is usually pretty short in there…I may have just spoiled my secret spot. Whoops! Where ever you decide to grab a beer, nothing beats chilling on the grass listening to the river rush by while you sip an ice-cold beverage. 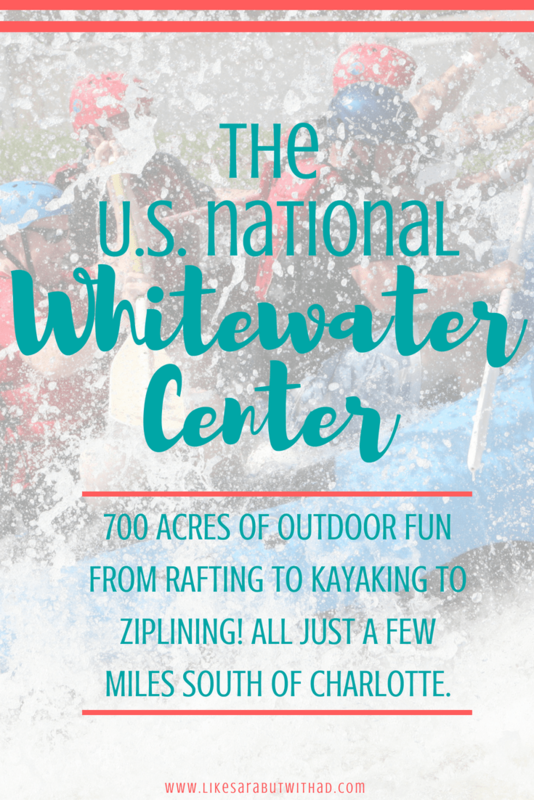 Another cool thing about the USNWC is all of the festivals and cool activities they have going on! There is something happening all the time from Riverjam all summer long, to turning the river green on St Patrick’s Day, to the Free Whitewater Yoga series! 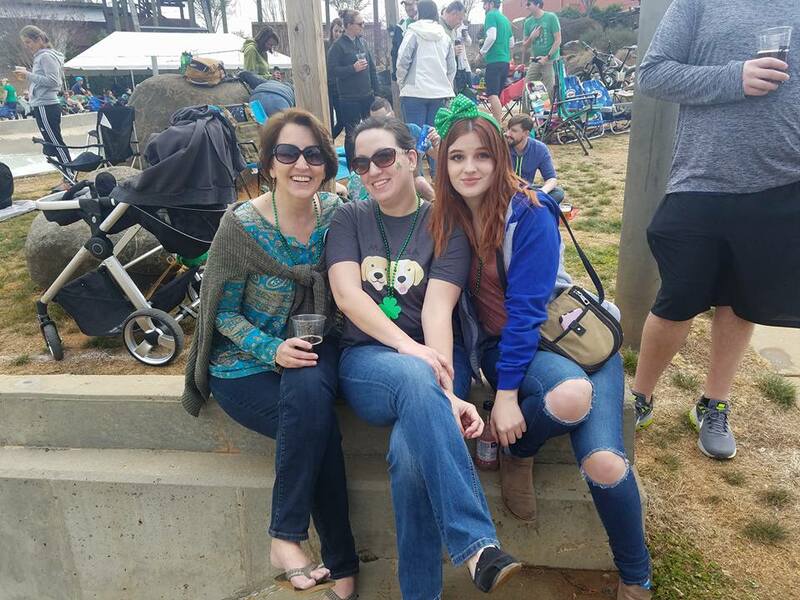 Waiting for the river to turn green at the St Patrick’s day celebration. A couple years ago, I signed up for the adventure dining with a co-worker, and we had so much fun! We got to do some paddleboarding then head back to an outdoor dining room where we had a fantastic meal and a wine tasting. 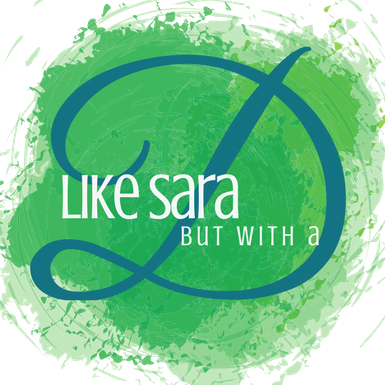 I definitely recommend it for a cool girl’s night or even a super fun date night! Honestly, the Whitewater center is one of my absolute favorite places to visit in the city. We buy the annual parking pass each year because we know we are going to spend sooooo much time there! It is perfect for families, dates, groups, or even just a little solo adventure. 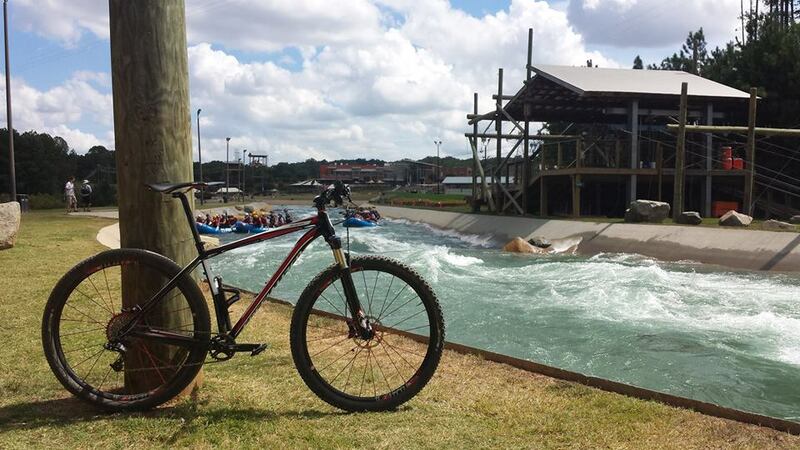 Have you ever visited the USNWC? What is your favorite activity? Looks like an awesome place and never heard of it! That dessert though,…OMG.